My boys love playing with water. It doesn't matter what season it is outdoors, but if water is involved, then my boys are all over it (see this math water sensory bin, this fine motor cup play, or this colorful magnet sensory bin, for example). So when I found some mini alphabet sponges at the dollar store, I was beyond excited! I knew that my boys would love them for bath time or for some water sensory play. Here's how we took the alphabet learning outdoors! A bucket of water, some colorful alphabet sponges, and a hot, sunny day were all we needed to do some fine motor, literacy-based sensory play. Then they (okay, I did too!) stamp away! 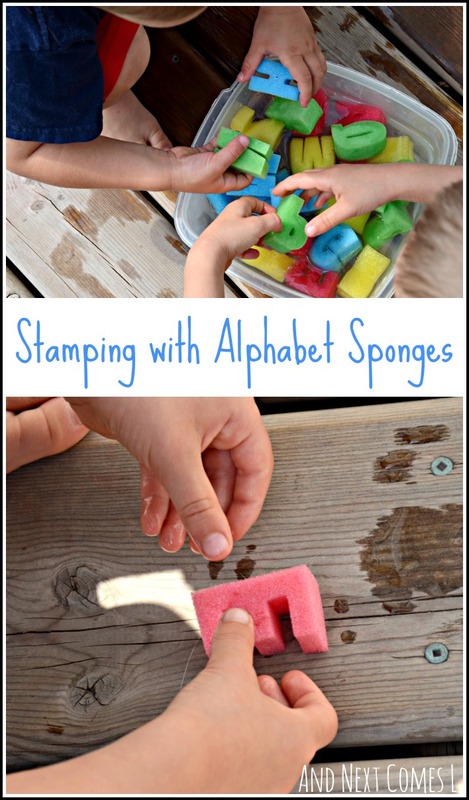 K preferred to squish, smash, and squeeze the alphabet sponges, but not without naming the letters first! J started off stamping, but eventually switched to drawing letters with the sponges instead.